Scalloping in Florida is a simple and fun choice for a summer activity on the water. From south central through north Florida on the Gulf coast, fishermen and families have enjoyed this pastime year after year. It is a water sport loved by many for its easy process and delicious results. Scallops can be found in very shallow water, and the legal limits allow for two gallons, un-cleaned, per person to be brought home. I’ve scalloped from Seinhatchee to Homosassa, but scalloping at the Plantation on Crystal River is definitely my favorite place to collect these underwater treasures. Crystal River seems to always hold the largest and most consistent number of scallops every year. The Plantation provides a wonderful all-around experience for scallopers, season after season. It’s a Florida resort, where they have everything from the marina to their chefs at the West 82 Grill to make your scalloping experience a breeze. There is even a service at the docks to clean your scallops upon arrival. Generally, people search for scallops in four to seven feet of water, providing manageable fun for the whole family. Swimming through the water, scallopers peer through their masks, and dive down to grab their catch, collecting them in mesh bags. It’s an easy and enjoyable activity, and the process takes very little physical strain. 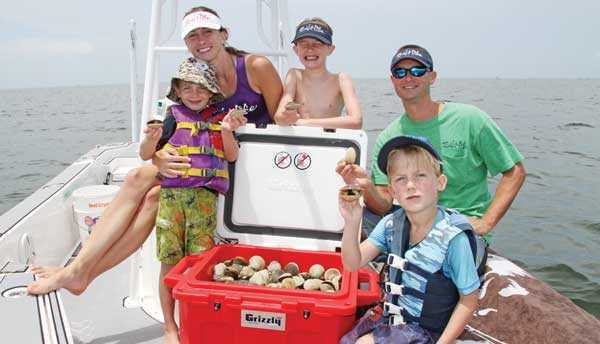 There are children from ages five or six, all the way to grandparents who enjoy scalloping, and it makes for a great day on the water for almost anyone. Florida’s two-gallon limit per person provides a generous amount of delicious scallops for everyone to enjoy at the end of each trip. If one desires to clean the scallops from the boat, it’s a painless process that requires a simple shucking tool or spoon. My favorite ways to prepare scallops include cooking them in the half-shell, scallop scampi, or lightly frying them. No matter how you cut it, Florida scalloping is a real treat for the entire family. It’s a fun and convenient way to spend quality time out on the water, especially if you’re staying at the Plantation on Crystal River!